The Greek government is preparing to try several lawmakers representing the Golden Dawn, a nationalist and anti-immigrant party that the government describes as “neo-Nazi.” The upcoming trial is related to the fatal stabbing of an anti-fascist rap musician on Sept. 18, by a Golden Dawn sympathizer. Golden Dawn, a far right wing party whose motto is “Greece belongs to Greeks,” has gained popularity at a time when the nation has been struggling with high unemployment as a result of the financial crisis and strict austerity measures imposed by the government. In the June 2012 Greek national elections, Golden Dawn gained 6.9% of the popular vote, entering the parliament for the first time with 18 seats. Since the party gained the seats, the government alleges that the group has also been involved in attacking and intimidating immigrants, whose presence has increased in recent years. Just last month, although prior to the stabbing, Golden Dawn’s support had risen to 13%, according to an opinion poll conducted by Greek company Public Issue. But it’s unclear how much the public support for Golden Dawn is really about their political agenda. About three-in-ten (29%) of the party’s voters said they voted for the party as a form of “protest,” although 27% for its stance on immigration and borders, according to Yannis Mavris, pollster and director at Public Issue. Another 14% mentioned the party’s program as the reason for their vote and 13% cited national issues or patriotism as a criterion for their choice. In August 2013, the unemployment rate in Greece reached nearly 28%, more than double the E.U. average, according to data from Eurostat. Unemployment among young people under 25 years old skyrocketed to 62% in June 2013. The prolonged economic crisis, which partly explains the rise of the Golden Dawn, has had a profound effect on Greek public opinion. In a March Pew Research Center survey, 99% of Greeks said the economy was in a bad shape, the highest percent among the 39 nations included in the poll. 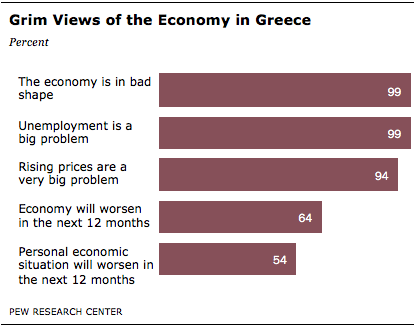 Moreover, 99% of Greeks said that unemployment is a very big problem and 94% were concerned about rising prices. At the same time, the Greek public does not expect the economic situation in their country to improve. A majority of the Greeks (64%) were pessimistic about the economy’s future in the next year and 54% believed their personal situation will be worse in the next 12 months.